The Himalayan grey langur (Semnopithecus ajax) is an Endangered colobine confined to the Chamba Valley of the Western Himalayas in Himachal Pradesh state in India. The langur has a narrow occupancy range spanning just about 200 km2 and a dwindling population of 250 mature individuals and 500 individuals in total. Fragmentation, deforestation, persecution and retaliatory killing due to crop raiding, and commercial horticulture expansion are threats of serious concern confronting the Himalayan grey langurs. 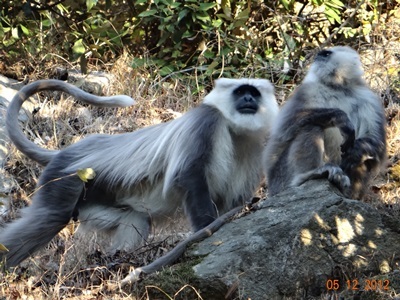 The very absence of concrete data on the Himalayan grey langurs, their habitats, human-langur relationships and threats warrant comprehensive field studies in Chamba Valley. The project thus aims to undertake baseline surveys on langur distribution, conservation threats, and human-langur relationship. These studies will aid in the designing and implementation of a holistic stakeholder involved participatory conservation program for the langur in the region. The project is the first of its kind in Himachal Pradesh and will open more venues for wildlife research and conservation in the region.